After our short trip to Chinese translation, let’s return again to Emily Dickinson, who is observing another morning. This LYL Band performance of “I’ll Tell You How the Sun Rose” is a bit imperfect. Alternative Parlando Project reader Dave Moore takes the lead here, but he and I are singing instead of our usual recitative, and we’re caught at the top of our singing range as well. Dave even bobbles a word in the line “The hills untied their bonnets.” So, yes, this leads to some imperfection—but this lyric is so perfect that perhaps it can carry us along anyway. I suggest you listen to this piece now and then read my discussion of what I see in it afterward. Dickinson, like a good melody, doesn’t require understanding before enjoyment. The player to hear it is at the bottom of this post. Isn’t that a strange way to sum up dawn? It comes up and it’s already past tense, like Meng Haoran’s morning in the last post, and Dickinson comments on this common splendor as if she’s a surprised alien from another planet who has never seen the sun. Her boast that she can tell us “how the sun rose”—something she and all of us should already know, set in nothing more special than a prosaic town—becomes instead a small, whispered, apprehended wonder. In the second section, Dickinson shifts gears so smoothly that no matter how many times you read or hear this poem you will never notice. 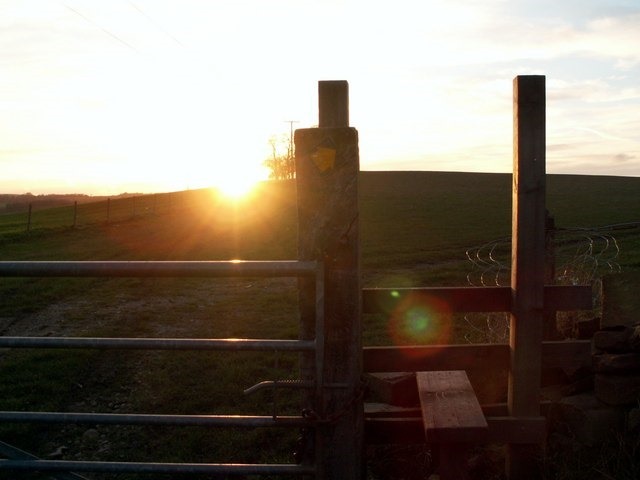 There is a little engagement of the gears as she says of sunset “I know not,” unlike our first gear’s “I’ll tell you;” but we’re soon on to a rural scene with the sun rays like children climbing up and then down a stairway over a hedge or fence row (a stile). At that point, there’s a bustle in your hedgerow as the dusk becomes a grey robed “dominie,” a strange and archaic word perhaps even in Dickinson’s 19th century, and a sure stumper for any modern English speaker. A dominie is a Latin word meaning the leader of a congregation, a minister, a pastor—and ‘pastor” is derived from the word for shepherd—and that’s just what our grey dusk becomes as it leads the children of the dawn, now dusk, away like a flock, closing the bars, closing the gate, so that they cannot return. That dominie seems so removed from the pleasant village of the first section, so foreign. Another subtle word choice contrasts the two sections. There’s only 88 words in this piece, and five of them are colors. “Rose” puns for dawn pink in the first line and then dawn is “amethyst,” a word for both purple and a semi-precious stone. The sunray children are “yellow”, and our strange dominie is dusky “gray.” The stile sunset stairway that the sunray children are climbing is “purple.” So out of our five colors, one of them is roughly the same color. In the first section, it’s semi-precious and wondrous, but in the second it’s just purple—a ruling, royal color perhaps—but those sunset ray children’s steps are ruled over not ruling, not shining like the amethyst steeples of the dawn. Did you listen to the performance of “I’ll Tell You How the Sun Rose” before reading all this? I feel a bit here as if I’m acting like that dominie myself, leading you past the plain and beautiful dawn, over the stile, and closing the gate to simply hearing the sound and the manner of expression of Dickinson. Too often we make too much of the meaning of poetry, and particular the deeper meaning of poems. Just as Meng Haoran’s poem from last time can be understood well enough to be enjoyed by children, this poem too can be enjoyed as compressed observation. Perhaps it’s because I am an old man, one who has tried to write and make music for many years, that I care to see what is underneath the sun rays, to look over the stile, and to find what is inside Emily Dickinson’s expression. To hear the LYL Band perform “I’ll Tell You How the Sun Rose,” use the player below.